A Cementery opposite to bars, discos, and restaurants? 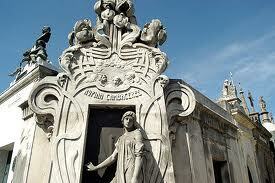 Weird but very nice...Welcome to Recoleta. 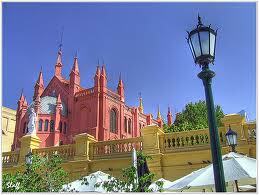 It´s not as old as La Boca or San Telmo, but it is as historically relevant as those two first city corners. In mid 17 th century, while the Southern neighbourhoods welcomed merchants, this was an unpopulated area used for the raising of cattle. 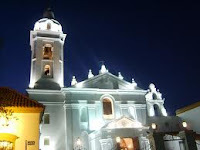 The first settlers in the area were the fathers of the Recoletos Congregation, who founded a graveyard, later expropiated by Bernardino Rivadavia in 1822. The flourishing of Recoleta and Barrio Norte as the most exclusive spots in the city took place around 1871, when a yellow fever epidemic caused the aristocratic families of San Telmo to forsake their beautiful mansions and raise newer and more sumptuos ones around the Alvear avenue and in the area of Callao avenue, right up to Santa Fe avenue. Since then, these neighbourhoods have never ceased growing. Many historic places and shopping areas have establish themselves as places that mustn´t be missed on this part of the city. Undoubtedly, the "Cementerio de la Recoleta" is one of these: Argentina´s emblematic figures, such as Evita and the former president, Domingo Sarmiento, have their resting place right here. To the side stands the "Del Pilar Basílica", the second oldest church in the city, and further ahead, the "Centro Cultural Recoleta", where art is displayed in all its diversity. Meantime, during daytime, one might walk along Alvear avenue, where the most important international clothing and jewelry stores have their headquarters, and if in search of national vanguard design objects, don´t hesitate to visit the Buenos Aires Design Complex. Moving further along, around Callao avenue and on Santa Fe avenue, all the way from 9 de Julio avenue, "Barrio Norte" displays its more commercial side. Two spots that can´t be missed on this articular tour are the "5ta. Avenida" and "Bond Street" galleries, renown for their shops dealing in vintage or punk style clothing. Location: Between Santa Fe, Pueyrredón and Del Libertador avenues. Main arteries: Santa Fe Ave., Callao Ave., Pueyrredón Ave., Alvear Ave. and Quintana Ave.
How to get there: Buses 17, 61, 92, and 130. Best time to visit: Sunday during daytime, so as to go by the Plaza Francia fair. Neighborhood corner: Quintana Ave. and Ortíz st.